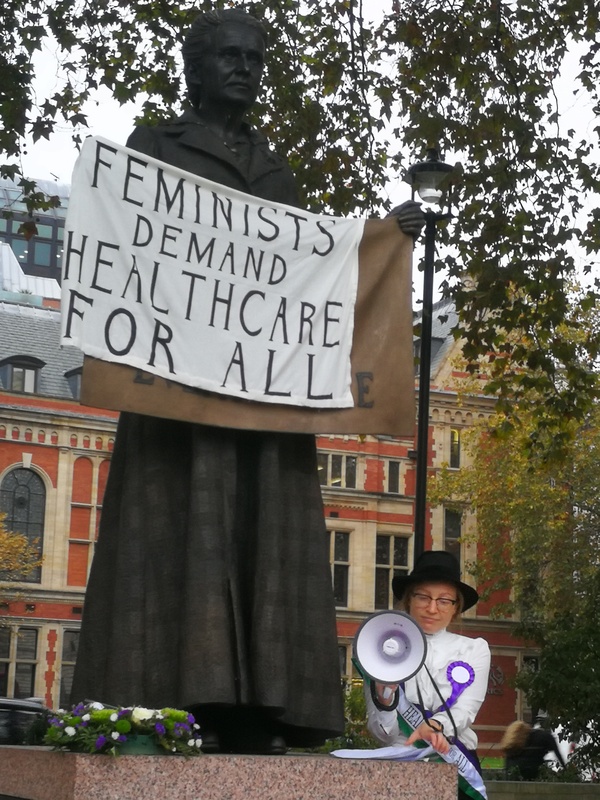 This morning, dressed as suffragettes, we changed the sign on the new Millicent Fawcett statue in Parliament Square from ‘Courage calls to Courage Everywhere’ to ‘Feminists demand healthcare for all,’ in protest against NHS charges for migrants. We changed the banner because universal healthcare, like universal suffrage, is a feminist issue. This year marks 100 years since some women got the vote, but women under 30 and 2 million working-class women who did not meet the property qualification had to wait another 10 years. Today, some people are eligible for free abortion and pregnancy services, which feminists have fought for, while others must pay enormous charges for the care they need. Migrants who are not considered “settled” in the UK are now charged for these essential, life-saving services at 150% of the cost. Abortion is charged up front, costing £1300 in an NHS hospital. Birth, including pre and post-natal care, is charged after the event, and costs up to £7000. Hospitals may pass debts on to a debt collector who will harass the patient. In fear of debt, deportation or because they are unable to pay, some people do not access the health care they need, with devastating consequences. There are reports of women avoiding antenatal care, even giving birth in parks, and being forced to carry out their own abortions. Ensuring everyone has access to the care they need, irrespective of immigration status is an critical issue for feminists. 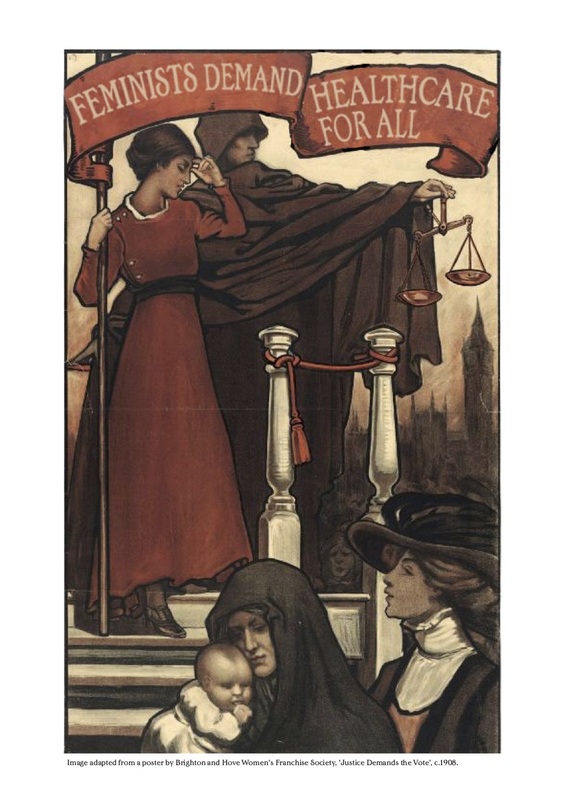 We need to counter the history of racist, imperialist and exclusionary politics that marked the suffragette movement itself, and move forward with a feminism that challenges oppression, and fights genuinely for justice for all. Feminist Fightback call for an end to these dangerous, racist and inhumane charges. The NHS should be free for everyone. Rights for some wasn’t good enough in 1918 and it isn’t good enough in 2018. 100 years after some women got the vote, let’s make reproductive healthcare accessible to all! 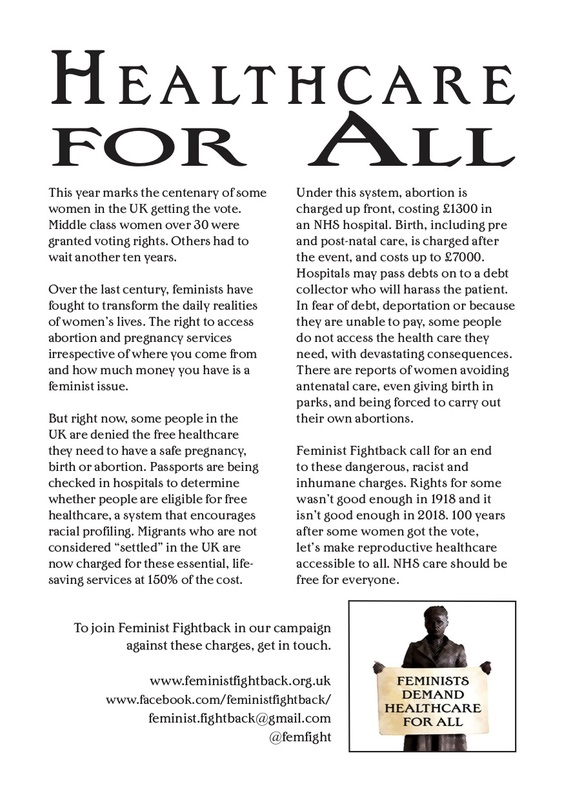 Come to a Feminist Fightback meeting and be part of our campaign to end the charges. Our meetings are open to all women, including intersex, trans and cis women, and to people of diverse gender identities in need of feminist solidarity. People of all gender identities can get involved with Docs Not Cops. The Patients not Passports toolkit has information on how you can start a campaign where you are or take action if you’re a healthcare worker.